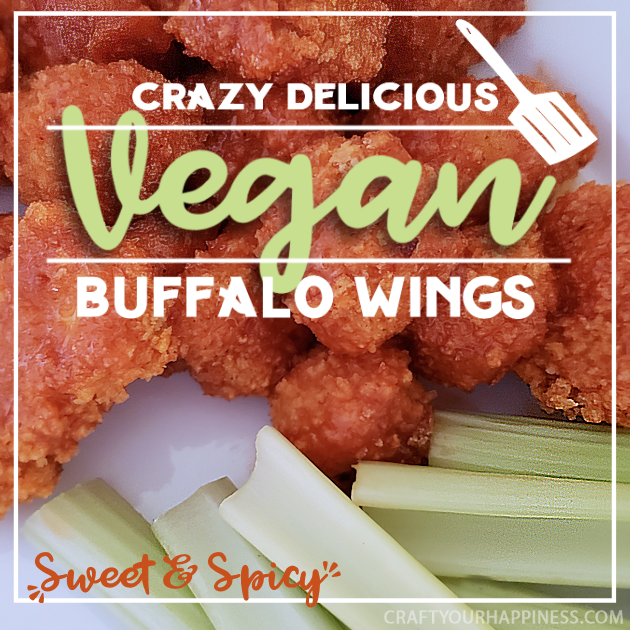 These crazy delicious vegan buffalo wings will be the hit of any party or meal! 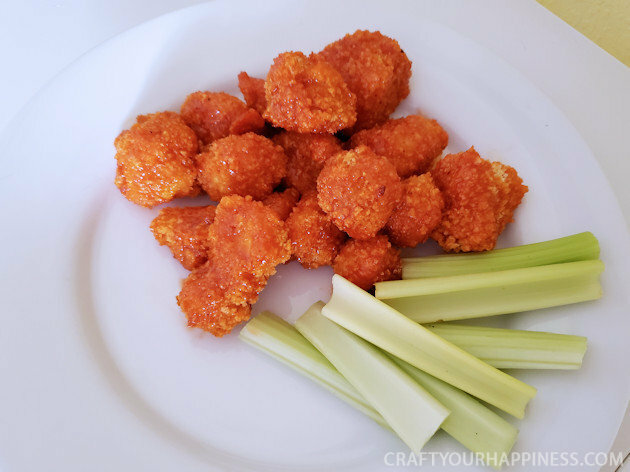 They can be served as an appetizer with a side of celery or as the main dish with rice, noodles and veggies of choice. They are healthy and low fat. The secret ingredient? Cauliflower! If you prefer a less spicy version just use a different sauce. If you’re looking for more “meat replacement” recipes check out our Meatless Meatloaf Lentil Loaf or Hearty Vegan Shepherd’s Pie. 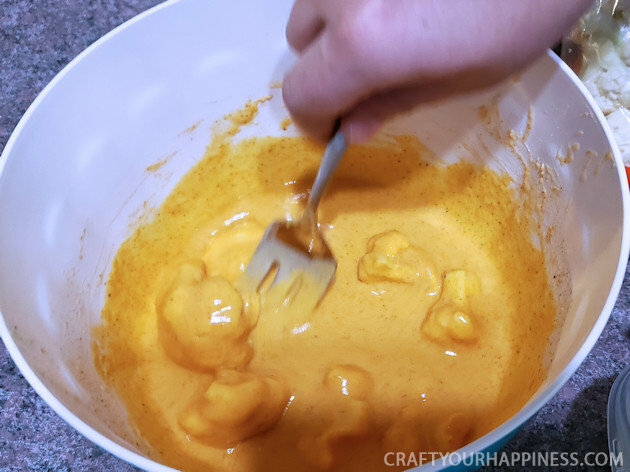 In a large bowl, whisk rice flour, garlic powder, cayenne, salt, turmeric, pepper. 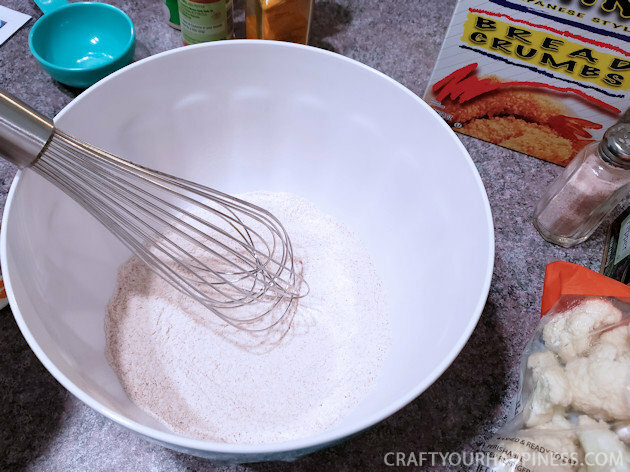 Add water and whisk until smooth and creamy. 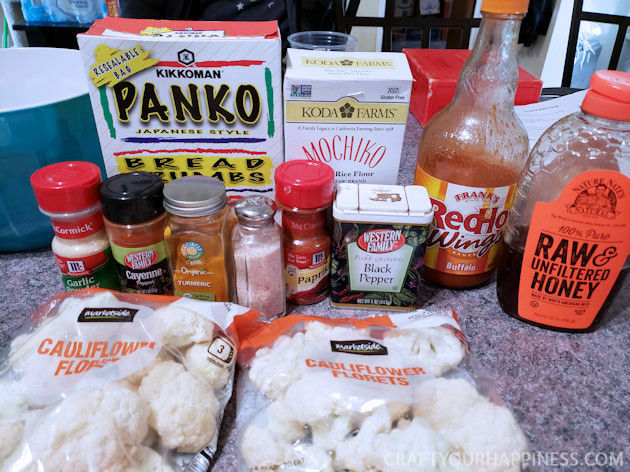 Cut cauliflower into bite size chunks. We bought bags of ready made fresh cauliflower. 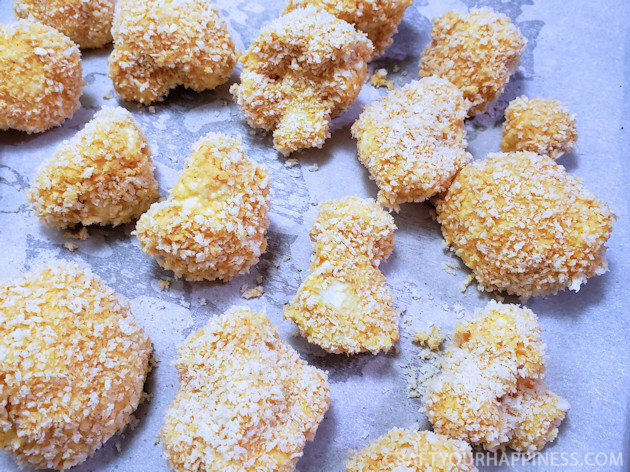 Drop cauliflower pieces into batter and coat. 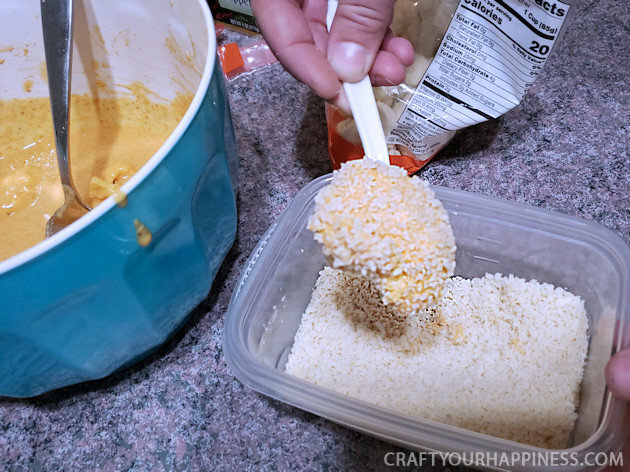 Using a fork, remove from batter and coat with panko. Place on cookie sheet. 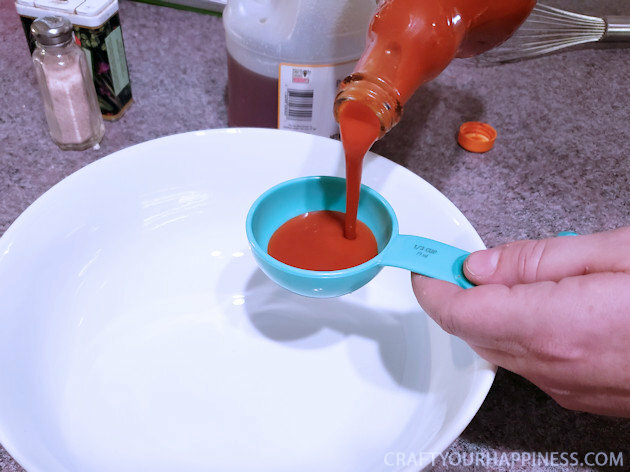 In a separate bowl, mix Frank’s hot sauce and honey. Divide into 2 equal parts. 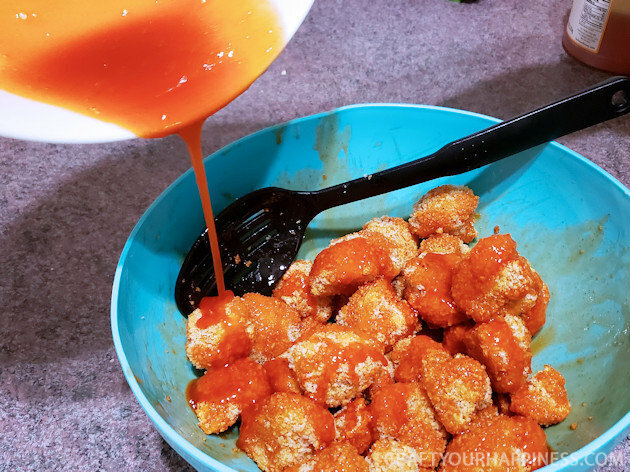 When cauliflower is done cooking, coat with half of hot sauce mix and return to oven for another 10 minutes. When done, drizzle remaining sauce over pieces and serve with celery slices or over a bed of rice. The ingredients. Feel free to change out the RedHot Wings sauce for something less “spicy”. 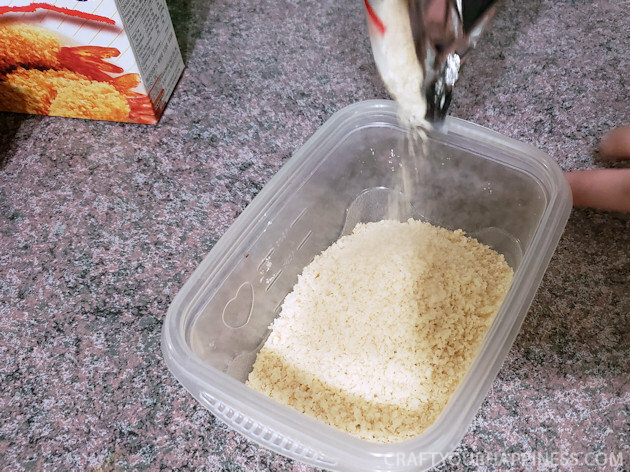 You do need to use the Panko Style breadcrumbs as those are more coarse and heavy which is needed to prevent mushiness. 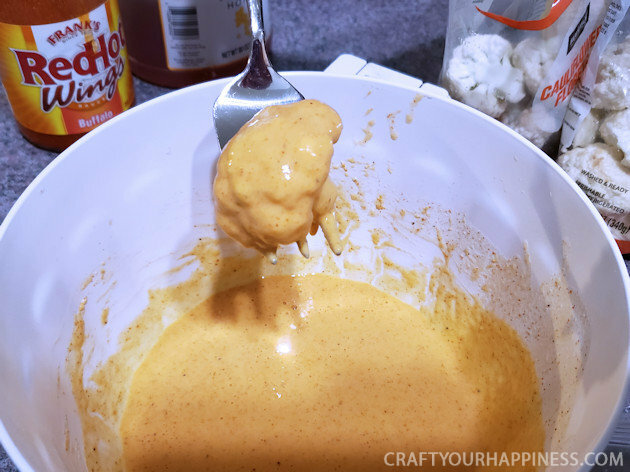 In a large bowl, whisk rice flour, garlic powder, cayenne, salt, turmeric, pepper. 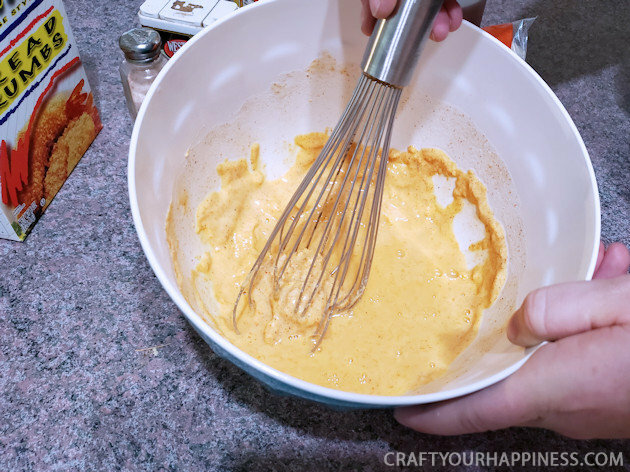 Add water and whisk until smooth and creamy. 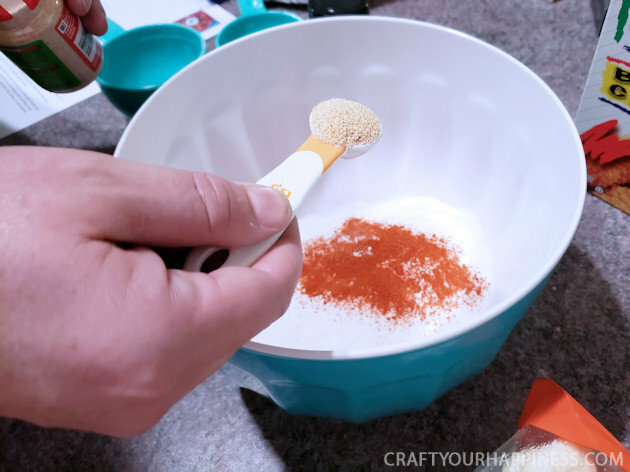 Place the breadcrumbs into a bowl or container. As you can see the Panko Style breadcrumbs are very coarse. 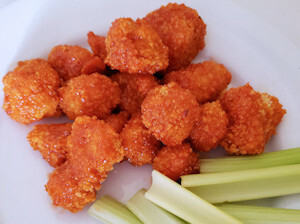 Drop cauliflower pieces into batter and coat. 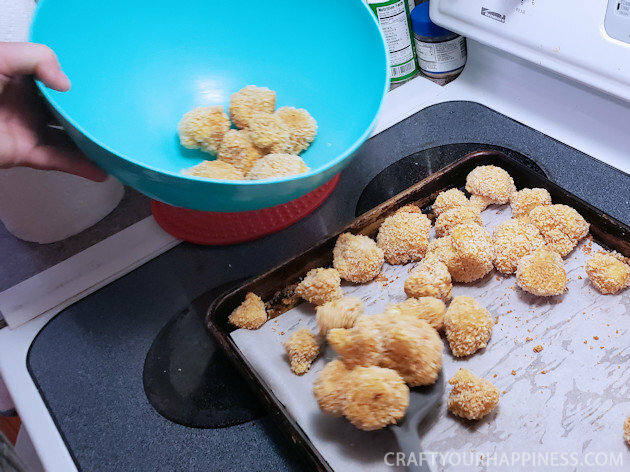 Using a fork, remove from batter and coat with panko. Cover a cookie sheet with foil or parchment paper. 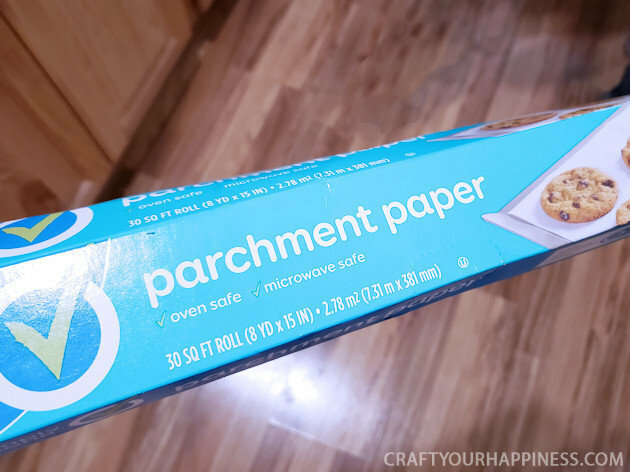 Once we started using parchment paper we’ve never gone back to foil for covering our pans. Its amazing and anything baked on it slides right off! 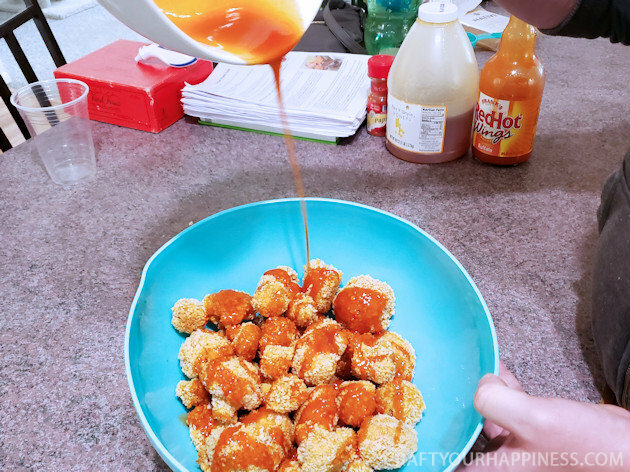 While the “vegan buffalo wings” are baking mix your hot sauce and honey dividing into 2 equal parts. 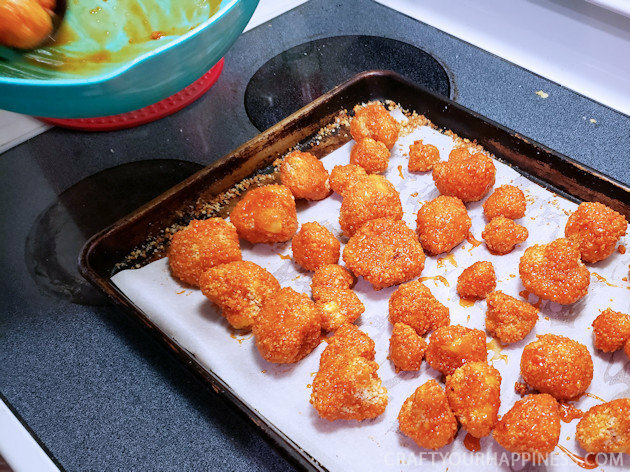 When cauliflower is done baking remove from cookie sheet and place in a bowl. 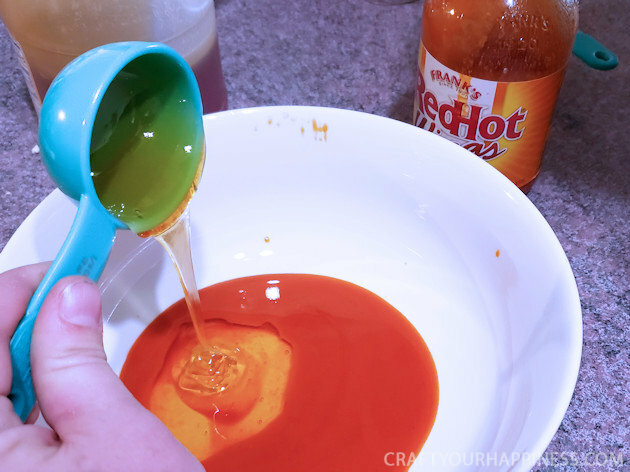 Coat with half of hot sauce mix carefully to coat. Place the coated “wings” back on the cookie sheet and return to oven for another 10 minutes. 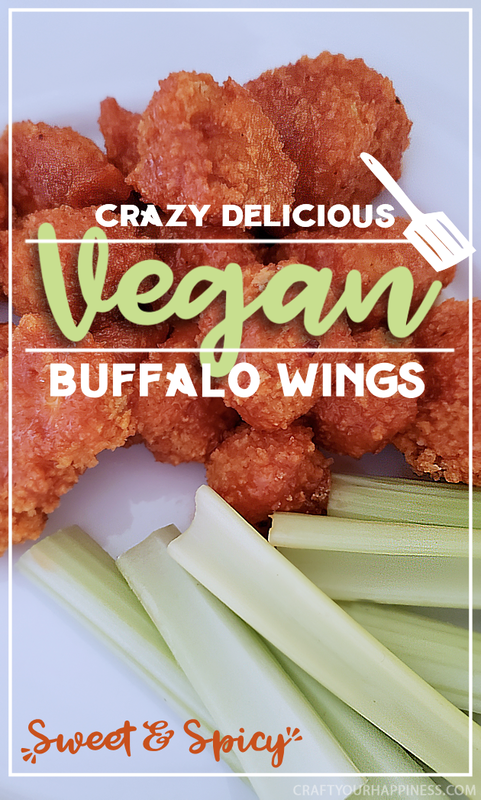 The finished Vegan Buffalo Wings are a perfect appetizer or as a main dish item.